“Again!” The hatchlings darted around her as she waded through the hip-deep water, pleading – as they always did before she returned to the surface – for her to recount the tale one more time. “You have already heard it a thousand times over,” she admonished. “Please?” They begged in unison. 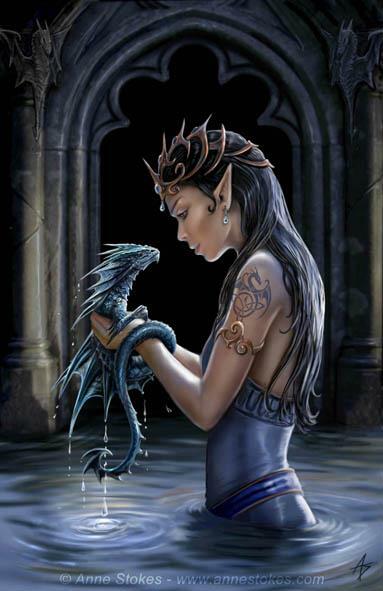 Drawing the smallest dragonet from the murky fluid, she held it before her with a stern expression. As she gazed into its earnest, slitted eyes, it lovingly wrapped its tail around her slender wrist. Her lips twitched, revealing her resigned bemusement. “Very well,” she relented, as she always did. Gently returning the creature to the water of the birthing chamber, she glided to the far end of the chilly, stone temple, and settled regally onto the edge of the central dais. She absently tucked a loose strand of her lustrous dark tresses behind one sharply pointed ear, smoothed the wrinkles from her sleek, cerulean tunic, and began to speak, her voice low and smoky. “In the days when the World was new, Men and Dragonkind became embroiled in a bitter war. Whatever incident sparked the conflict was lost from the Chronicles and it was not for many ages that it became clear that neither side could ever emerge victorious. In order to broker a peace, Kalani, the Queen of Men, offered to become one with the Dragon Caliph, Garron, so that the races would be forever joined by blood. Garron accepted the queen’s proposal and an extravagant celebration was prepared to commemorate the end of the Great War. However, Kalani never intended to fulfill the agreement. On the day of the feast, she secretly adorned her lips with a poison so that the first kiss she shared with Garron would be his last, paving the way for her conquest by treachery. All went according to the queen’s designs, until her youngest daughter, a girl in her twelfth year and the only person – besides herself – that Kalani had ever loved, congratulated Kalani with an impulsive kiss. At this point in the story, she paused to allow the hatchlings to consider what Garron might have done. She watched them impassively as they swarmed before her, and then drew a breath to continue. “Garron had had his fill of battle, yet he was not a weak ruler. He demanded that Kalani immediately surrender all subterranean territory to his people while Men remained above ground before he would heal the girl. Once Kalani agreed before the entirety of the World, Garron took the young princess below to his stronghold – to this very temple, in fact – to be restored. Her recovery was not an easy thing. It took two seasons and left her significantly less human than she had been. Her survival was of such importance to the fragile peace that Garron supervised her care personally, and in doing so, gradually came to love her. When the day came for her to return to her mother, the princess left Garron with a heavy heart and ascended to the surface. Her ordeal had made her unrecognizable to Kalani, who demanded she prove her identity. Humiliated and betrayed, the princess spurned her mother and declared her love for the Caliph. Realizing her mistake, Kalani begged to make amends with her daughter. The princess was soft of heart and relented. A contract was made which finally brought a lasting peace to the World. “Yes, Mother,” came the discordant response from the water. She turned back quickly to hide her tears as her sinewy, undulating tail carried her to Kalani. All that from a single image. Amazing Tawn.